7summits.com's Harry Kikstra's new guidebook about Mount Everest, the summit of Asia and the world. The seven summits, the highest peaks of the 7 continents: Everest, Aconcagua, Denali, Kilimanjaro, Elbrus, Vinson, Carstensz! Trips, Statistics & information! Lincoln Hall, Everest summiteer and survivor, and author of "Dead Lucky"
At 8848 m (29,028 ft) Mount Everest is the world's highest peak. Even the trek to Base Camp is arduous. Climbers aiming for the summit must survive the extreme conditions of the 'Death Zone' and perform great feats of endurance. It is the same size as the Aconcagua & Denali pocket guides and fits in most pockets, being only 115grams/4oz and 14.5 x 11.5 x 0.8cm in size (5.7 x 4.5 x 0.3 inch). It can handle the snow, wind and cold you will meet on Everest without weakening the pages. Click on the thumbnails below to view sample pages from 'Everest, summit of the World' in standard PDF format. To reduce loading time, image resolution has been limited in these screen samples, but all photographs in our books are printed at the highest technical quality. All text and images are fully copyrighted © Rucksack Readers and licensors: please respect our intellectual property. Most modern computer systems already have Adobe Acrobat Reader installed. If yours doesn't, the above samples won't work: please download the Adobe Acrobat Reader. Health issues, equipment and training for Everest. Just a quick email to say how much I enjoyed reading Rucsac Readers' Harry Kikstra's 'Everest, Summit of the World'. In fact, I thought it was brilliant. None of the many Everest expedition books, detailing the hardships, which I've read, have brought home just how arduous the mountain is, nor how committed you have to be, as clearly as Harry. I think it's partly because he writes so well, simply, clearly and lucidly; partly because it's a guide to planning the trip, so there's no need to inflate the prose beyond being simply factual. And, in keeping with all your titles, it's amazingly comprehensive for a relatively slim volume. Just in case you might want to use this endorsement anywhere, I ought to say it's entirely unsolicited, and I have no connection with Rucsac Readers or Harry Kikstra, other than as a satisfied customer. So keep up the good work! Harry, Duwaine and I absolutely love your books. The format is fantastic and the content very useful. We are using it and "The Art of Glacier Travel" to prepare for Rainier and then Denali. I also appreciate you signing our copies. Does 7summits lead excursions up Rainier? We are going to be looking for an outfitter to do some training and then gain some experience with them. If not, can you recommend someone good? Wow! A message from Harry himself!! 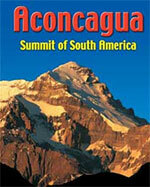 I used your guides on both Denali and on Aconcagua and found them both very, very helpful!! So, thanks for writing them and doing such a great job. The Everest guide is right next to me now as I plan for 2011. Thanks again for everything, Harry. This is the ultimate `bible' dedicated to climbing McKinley. What a pleasure to read an up-to-date, comprehensive guidebook for climbing in one of the most beautiful yet inhospitable environments on Earth. The wonderful pictures remind me of the awe-inspiring scale of the Alaska Range and a memorable expedition. It's informative, enjoyable and beautifully presented, and should be top of every Denali adventurer's kit list, to accompany them every step of the way. The format is snowproof, windproof and probably climberproof. In the military, we use TAMs (Tactical Aide Memoires) to cope with every imaginable situation, and Harry's book is the ultimate TAM for climbing Denali. Whether it guides you to the summit, or merely adds to the library of the armchair adventurer, this book is an essential part of the team. "This book contains lots of good information and advice and it'll help you prepare for your expedition. But to climb Denali you also need patience and hunility"
yes, it's that time again. Time to go and freeze your a** off for weeks on a monster mountain for... well, it doesn't matter what for. Go big or go home, we say. And if you're going big on Denali, this little gem of a book is required reading. I admit I was pretty suspicious at first, but the author gets it right with his advice on tackling the Big D. The author is Harry Kikstra, who has summitted Denali twice via the popular and non-technical West Buttress route. He also maintains the website www.7summits.com for those people whose egos are writing checks their bodies can't cash. Whatever. The point is the book has some good advice, everything from a concise summary of the effects of altitude to dealing with the extreme cold to GPS coordinates for camps. This book rivals Coombs' Denali's West Buttress in information content and has the advantage of being even smaller (and waterproof! ), as well as more recent. Kikstra takes pains to be even-handed as he describes the advantages and disadvantages of going guided vs. unguided and other topics. As the author states, "...climbing Everest is good preparation for climbing Denali." It's a serious rock, and this book does it justice in the smallest possible format. So if you absolutely, positively have to freeze your johnson off at altitude, give this guidebook a try."